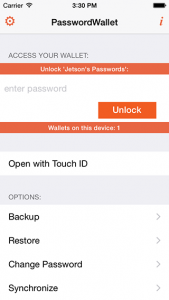 There is a conflict between iOS 8 and the old PasswordWallet. 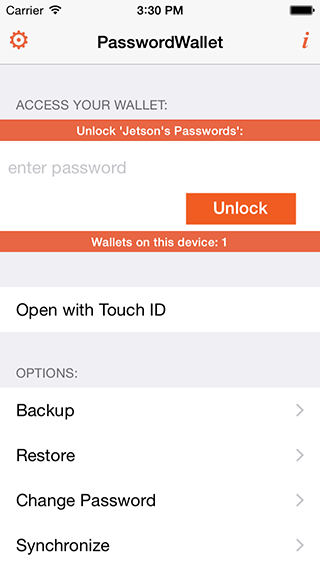 Please update to PasswordWallet 4.8.0 for compatibility with iOS 8. The update is free and your data should still be on your device after the update. However, we suggest backing up your data before you upgrade, just in case. Please follow the instructions below. Download and install PasswordWallet for your Mac or Windows computer from our web site. You don’t have to buy it. The demo period is very long and should get you through until the iOS version is updated. PasswordWallet for iOS 8 is coming soon! The new version will sport unlock with Touch ID, new password generation templates just like PasswordWallet for Mac or Windows. And a whole new look and feel for a great iOS 8 (or iOS 7) experience. Stay tuned! We’re very excited about this next update and we hope to have it up on the AppStore in just a few days! Update 2: Yes, this will be a free update for all users of PasswordWallet for iOS. Update 3: PasswordWallet for iOS 8 was submitted to Apple a few days ago. It’s just awaiting approval from Apple. Update 4: I’ve asked Apple to expedite the approval process, and they’ve said they would. Update 6: [Sept 18, 1:05 pm PST] We just received word that PasswordWallet 4.8.0 for iOS 8 has been approved by Apple. From experience we know it will take a few hours for the app to appear in the AppStore. All users should back up their data before updating.